One-time supporter of the Ayn Rand Institute (then later of David Kelley’s Atlas Society) businessman Ed Snider has passed away. 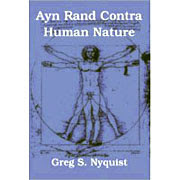 Someone just “published” an 11 page biography of Ayn Rand. “Ayn Rand Myths” says it’s a myth that Ayn Rand disapproved of homosexuality (because Leonard Peikoff allegedly doesn’t) and that Alan Greenspan didn’t admire Rand. Yaron Brook, president of the Ayn Rand Institute, has just published “Equal is Unfair.” A lecture by Brook on the topic is here. Was Bowe Bergdahl Going Galt? The latest edition of Serial highlights the influence of Atlas Shrugged in Bowe Bergdahl's decision to quit his post. This older article adds further detail. Anthem is a dystopian novella written in 1937. It is unique in Rand's ouvre in a number of ways. It is largely plotless (as Rand herself admitted) and it's much shorter than her other published fiction. It's more a parable than a story, and while it lacks the portentousness of her last novels, honestly, it's little more than a trifle. It's a short piece of fiction which has its basis, initially, in Rand's experiences during the early years of Soviet Russia. In Anthem, Rand took some of the high moral rhetoric that was used to defend communism in Russia and took these scraps of incoherent sentimentality to its logical extreme. • There are forty-nine countries where Muslims are in the majority and Craig Biddle can’t wait to nuke ‘em all. • You’re 50 years young Objectivism – and it’s time for a reboot. • The Gotthelf and Salmieri Companion to Ayn Rand is out. I have a preliminary review. • The increasingly ARI-dominated Ayn Rand Society has a new blog, Check Your Premises (not to be confused with the anti-Diana Hsieh web site). • This is a little older, but former Ayn Rand associates Allan Blumenthal and Joan Mitchell Blumenthal self-published some books in 2013. Of all of Ayn Rand's published fiction — and, indeed, of nearly all her writing, published or otherwise — We the Living is the easiest for the non-Objectivist to appreciate. Most of her chief faults as a novelist are absent from the book. The characters and situations of novel are more or less real, (and all the more vivid and powerful for being so). The prose is largely straightforward, direct, unadorned. It may be the best Russian novel written in English. I wish Rand had written more novels like We the Living. But, alas, that was not to be. Oddly enough, We the Living was the most reviewed of any of Rand's books, receiving more positive than negative notices. H. L. Mencken, who, in the twenties, had been one of the leading literary critics in America, described Rand's first novel as "a really excellent piece of work." The novel, however, struggled to gain an audience in the 1930's, and Rand's publisher, Macmillan, destroyed the plates after a modest print run of 3,000 copies. In 1959, Rand issued a second, revised edition of the work. Rand insisted that "all the changes [she made] are merely editorial line changes." This view has been challenged. It seems that Rand indulged in a little more than mere line changes, that she sought to edit her former self in order to conceal some of the views she had flirted with in her youth.